Three parishes in the area of what became the Thorne Poor Law Union — Fishlake, Hatfield, and Thorne — established poorhouses under the old poor law. The regime in these on the eve of their dissolution is known from a report made to the West Riding court of quarter sessions in January 1836. The report also included the workhouses at Bawtry, Barnby Dun and Tickhill parishes which became incorporated into the adjacent Doncaster Poor Law Union. Report on the Workhouses in the Lower Division Of Strafforth and Tickhill presented at Sheffield Sessions, October 1835, and thence Adjourned to Doncaster, January 1836. That generally speaking they are in a good and orderly state, the Bread and Provisions being apparently sufficient both in Quantity and Quality and the Apartments clean and well ventilated — With respect to the Sleeping Rooms at Hatfield, Fishlake, Barnby Dunn and Bawtry, owing to the filthy condition in which these Establishments were formerly kept the Fabric of the Buildings both Walls and Floor Boards are so completely infested with vermin that in spite of every Endeavour by Whitewashing, taking down Bed Stocks etc., it is impossible to extirpate or even keep them within moderate Bounds of Comfort, and the Paupers have in consequence suffered a serious Privation of Rest during the recent hot Summer. I have therefore to recommend that an Order of Sessions do issue to the above Parishes to provide Iron Bedsteads with elastic Ribs in lieu of those at present in Use, which are of Wood and mostly old and want renewing. The Effect of Iron Bedsteads in preventing communication with the invested Parts of a House is generally admitted, and will I trust in this Instance prove a Means of greatly relieving the Paupers from further Annoyance. For more particular information relative to each Workhouse I must refer to the Schedule hereunto annexed, and which has been drawn up after Reference to the Respective Overseers: The Diet Table at Thorne is the best as they have Meat in some shape or other every Day but Wednesday. Bawtry is decidedly the worst Workhouse, all the Beds being of Chaff and only 12 ½ pounds of Meat for 10 Persons including Bone and Suet of which latter is made Dumplings their only Diet three days in the Week, and no Bacon as in other Workhouses. Barmby Dunn and Bawtry Workhouses ought to be more frequently whitewashed not less than three times a Year — All the Parishes except Fishlake bake once a Week at least, and I have ordered that Parish to do the same. It would be very advantageous for the Clergyman of each Parish authorised in the Manner pointed out by the 30 G.3. c.49, to inspect the Workhouse more frequently than can possibly be done by distant Magistrates. Fishlake Workhouse visited 12th August 1835. William Briggs and Wife Master and Mistress — No Children. Originally a Farmer and Publican. Been in this Situation three Years. Has 3	3	15 Land at £4 Rent per Annum under the Parish, who find him a cow, and four Waggon Loads of Coal in the Year. Contract 2s. per Head. 6 Men and 3 Women. Women do House Work. Men are mostly too old to work, such as can are employed on the Roads. Clothing belongs to the Parish and is renewed as wanted. No other place joins this Workhouse. House whitewashed three times a Year. Diet: Breakfast and supper, boiled Milk and Bread. No small Beer or Tobacco or Tea unless found by Paupers. The Medical Man makes out a Bill for Attendance on the Paupers, without any Contract — Each Overseer employs his own Family Attendant. Hatfield Workhouse visited 12. August 1835. Joseph Batty and Jane his Wife formerly Farmer near Gatewood have been appointed about a Year last March: they have two children and Joseph's Mother living with them. The Contract is 2s. 6d. per Head with a Garden about one rood with 4 acres of Land and a Run for 2 Cows in the Lanes and 2 ½ Waggons of Coals. The Women find their own Tea — The Men their own Tobacco. About 20 lbs. of Butcher's Meat per Week including Bone and Suet. About 72 Stone of Bacon consumed in a Year, or 1 Stone 5 lb. per week. There are at present 6 old Men — 14 Women and one Boy. The Contractor has nothing to do with the Profits of their Labour, nor is any work found for them — The Women do the Work of the House, and some few can spin — the Men, or such of them are as able, are employed upon the Roads. In truth the Men are usually old and past Work. The Bread is baked once a Week. The Inside of the House whitewashed twice a Year. The Beds taken down once a Summer. The clothing belongs to the Parish. No other Parish joins this Workhouse. The Parish pays about 18 or 20 Guineas per Annum for Medical Attendance upon the Poor residing in the Parish — the House is included. When out of the House the Overseers are to determine who are to receive this attendance gratis. Thorne Workhouse visited October 14, 1835. John Pine and Wife, was 16 ½ years Brewer-Man at Whitfield's Brewery, Thorne, appointed April 1832 — No children. No Place joins this Workhouse. Contract 2s. 3d. per Week a Head with a large Garden and about 5 acres of Land. 13 Men — 7 Women — 11 children — Total 31. 13 Bed Rooms, 21 Beds — Bedsteads Oak and Deal — Beds mostly Feather — Coarse sheets allowed — Bedstocks taken down twice a Year — very few Bugs at present. Clothing as well as Bedding and Furniture belongs to Contractor. House, part whitewashed twice a year, Chambers oftener. Labour belongs to Contractor: Women do work of House — Men work in Garden and Land and feed 6 Pigs and Cows. Work from Breakfast to Dinner the thence to 5 o'clock. Coals about 15 Waggons a Year — 9 Winter — 6 Summer. Each Medical Man in Thorne takes in annual Rotation the Paupers in and out of the Work house for Medicine and Attendance at £30 per Annum. Breakfast — Women, Tea — Men, boiled Milk and Bread. Supper Men, cold Milk and Bread — Women Tea. No stint in Bread — From 35 — 40 lbs. of Beef bought weekly — 140 Stone Bacon annually consumed. 3 Oz. of Tea weekly besides Tea Leaves. Hatfield's workhouse stood at the eatern end of what is now Station Road. 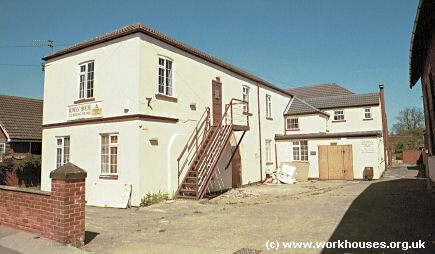 Hatfield former parish workhouse, 2006. West Riding of Yorkshire: Fishlake, Hatfield (2), Skyehouse, Stainforth, Thorne (3). County of Lincoln: Althorpe, Amcotes [Amcotts], Belton (2), Crowle (2), Eastoft, Epworth (2), Keadby, Wroot. The population falling within the union at the 1831 census had been 14,918 with parishes ranging in size from Eastoft (population 224) to Thorne itself (3,779). 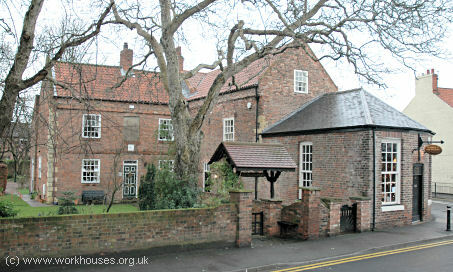 Thorne Union workhouse was erected in 1838 on a site at the west of Thorne. The Poor Law Commissioners authorized an expenditure of £3,315 on construction of the building which was intended to accommodate 200 inmates. The building broadly followed the popular cruciform layout as shown on the 1906 map below. 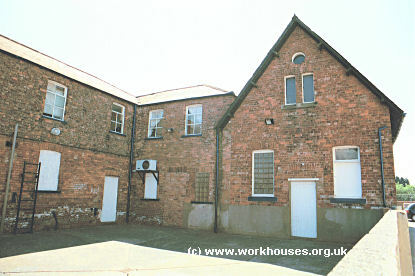 The entrance to the workhouse was at the eastern side. Thorne workhouse from the east. Thorne main block from the south-east, 2001. Thorne main block from the north, 2001. A casual block was erected at the east of the site, and infirmary was erected at the west with a mortuary to its rear. Pigs were kept in an area behind the mortuary. Thorne infirmary block from the south, 2001. By the late 1920s, the workhouse could house 111 inmates, although its average occupancy was around 80. In 1930, the workhouse was taken over by the West Riding County Council. At that date, it could house up to 108 inmates, including 29 males and 5 females in the casual wards. The establishment was recorded as being scrupulously clean though in poor repair and heated by open fires and lit by gas. It was too small to become a Public Assistance Institution so was closed a few years later. The casual wards, noted in 1930 as being "totally unsatisfactory" and "of the most primitive type" stayed open until 1941. Part of the main block survives and is now (2000) used as the headquarters of a Sea Cadet Training Corps. 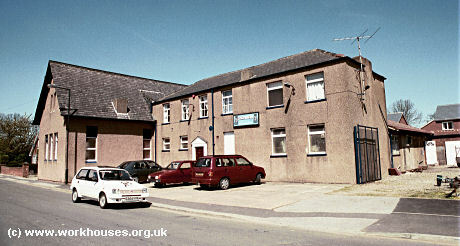 The former infirmary later became Rowan House nursing home but is currently empty. Doncaster Archives, King Edward Road, Balby, Doncaster DN4 0NA. Virtually no local records survive. Only holding is Guardians' minute book (1837-42). More pictures of the original building by Keith Platt: 1, 2, 3, 4. Thanks to Brian Barber at Doncaster Archives for the 1836 Quarter Sessions transcription.